I have a new favorite green shampoo, and if you know me (and my eternal hunt for the perfect green shampoo), this is big news. The Vermont based minimal green skincare brand, Ursa Major, just added shampoo and condition to their tightly curated selection of products and after one use (I literally just got out of the shower and ran to my computer to log down this review) I am smitten. For the longest time, I used their all-in-one face/body wash as a scalp rinse but now don’t need to because this shampoo is everything I’ve dreamed the brand would create. 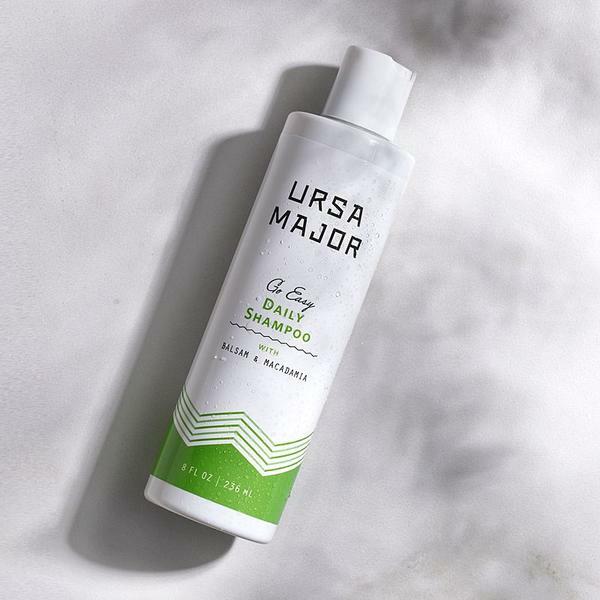 Read on for my review of the new Ursa Major shampoo and conditioner. Review: Ursa Major products seem so simple from the offset, but when you look at their ingredient deck you realize just how thoughtful and complex each product really is. This is the case with their shampoo. At $26 for a large 8oz bottle, one might expect filler ingredients like a water base or inexpensive oils like sesame seed or apricot oil, but no, this gorgeous shampoo uses soothing and nourishing aloe as its base and thoughtfully includes macadamia oil; the fatty acid content of macadamia oil makes it great for hair products since it calms frizz, nourishes hair follicles, adds strength and shine. Even the simple, yet refreshing scent of spicy pine and citrus is so thoughtful. The brand includes licorice root extract, which is known to help prevent hair loss, stimulate hair growth and hydrate the scalp, and juniper, a not only delicious smelling essential oil, a potent EO used to treat itching, psoriasis, eczema, seborrheic dermatitis, and dandruff for its analgeic and antiseptic capabilities. I really could go on and on about each ingredient in this shampoo, but I need to get to the experience of this gorgeous product! The lather is PHENOMENAL. Sodium Lauroly Methyl Isethionate is used as the foaming agent; a coconut surfactant that is gentle, nontoxic and should not be confused with sodium laurly sulfate. This shampoo is sulfate free and is an incredibly mild surfactant, one of the safest on the market. It’s gentle, yet effective at removing excess oil, dirt and debris. I’m a big fan of green shampoos that lather and rinse well like this one does. I shampoo every other night, sometimes every night and so I need a shampoo that can cleanse without overstepping and this one delivers just that. Hands down this is my current favorite green shampoo right now! Scent: The scent reminded me of pine trees, cinnamon and orange peels. Not over powering, subtle, yet refreshing. Tip: Take your time in the shower and really enjoy this shampoo! Review: While the shampoo “wow-ed” me, the conditioner was only OK. I personally prefer a thicker, more moisturizing conditioner than this one, but I think if you like a very lightweight feel, or have thin/limp hair that doesn’t like to be weighed down with moisture, then this is a great conditioner for you! Most conditioners contain a blend of butters and rich oils, but this one uses jojoba and macadamia seed oil – two medium body oils. There’s also a nice blend of citrus oils to give the scalp and hair a bright feel from their astringent properties. Tip: Usually, I avoid applying conditioner near my roots since I opt mostly for heavier conditioners, but I like that this one is so lightweight I can actually apply it near the crown of my head and not experience any heaviness.